Pieces created for the Art Bead Scene monthy challenges. I made the pendant from polymer clay and a glass nugget. The sculpted spiral at the bottom reminded me of the roses in the image. I picked up the olive-green colour in the cords I used. I decided to form slightly meandering macramé as a reference to the organic stems in the image. 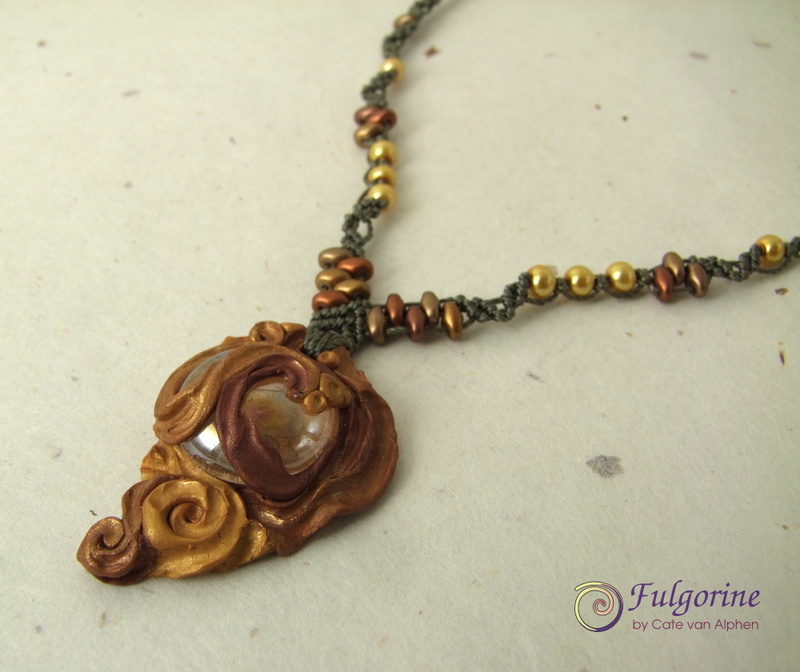 I added a scattering of gold pearls and bronze beads to echo the colours of the pendant. It’s quite a short – nearly choker length so I have added an extender chain to ensure it will fit. I have finally finished sanding the polymer clay inro that I made for the Art Bead Scene monthly challenge. I combined this challenge with my personal challenge of making a vessel each week. I had originally intended the inro to be a necklace pendant, but I also wanted it to be big enough to be functional i.e. a key and some cash will fit inside. As a necklace it’s a bit bigger than I’d be comfortable wearing, but I have strung it in a way that allows it to be adaptable… or maybe it just doesn’t know what it wants to become when it grows up. If you pull the two beads below the box the cord can be tied in a knot, shortening the necklace into a strap so it can be used like a purse with tassels below. Similarly it could be tied to a belt using a larks head knot and worn in a more traditional way. The little red ribbon is actually of vital structural importance and replaces the netsuke in stopping the sliding bead (ojime) from falling off the top of the necklace. It took me nearly a week to come up with that! I wanted something that wouldn’t be uncomfortable at the back of the neck if worn as a necklace. I like the cheeky bit of asymmetry it adds. Although I’d like to claim full responsibility, the necklace I made for this month’s ABS challenge seemed to make itself. 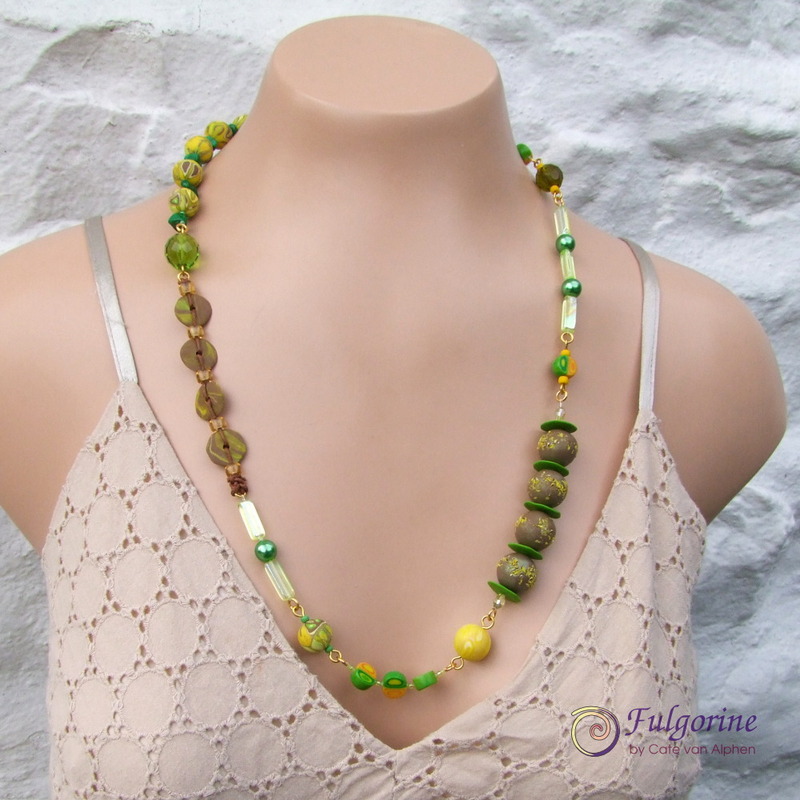 It all started when I was taking photographs the polymer clay beads I made for my Etsy shop, and I was inspired to put the green and brown beads together. 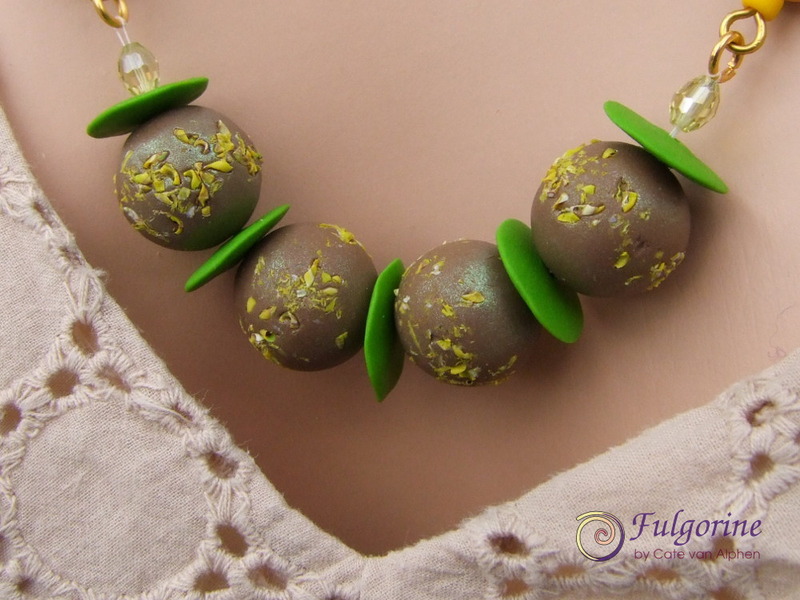 I loved the combination, but unfortunately I only had four of the brown beads. The strand wasn’t even long enough for a bracelet, and they didn’t work so well together when “watered down” with other beads. Then I remembered when I was back at school (in my original zigzag phase) I did a drawing of the Midgard Serpent with small sections of different patterns all down the length. 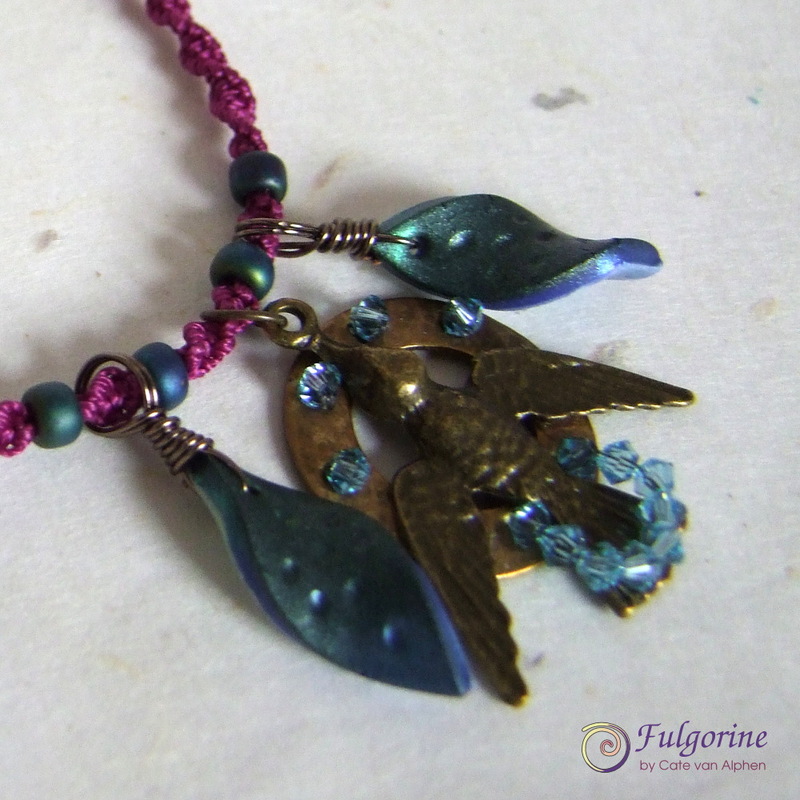 This gave me the idea to make a necklace using several short motifs of different beads. 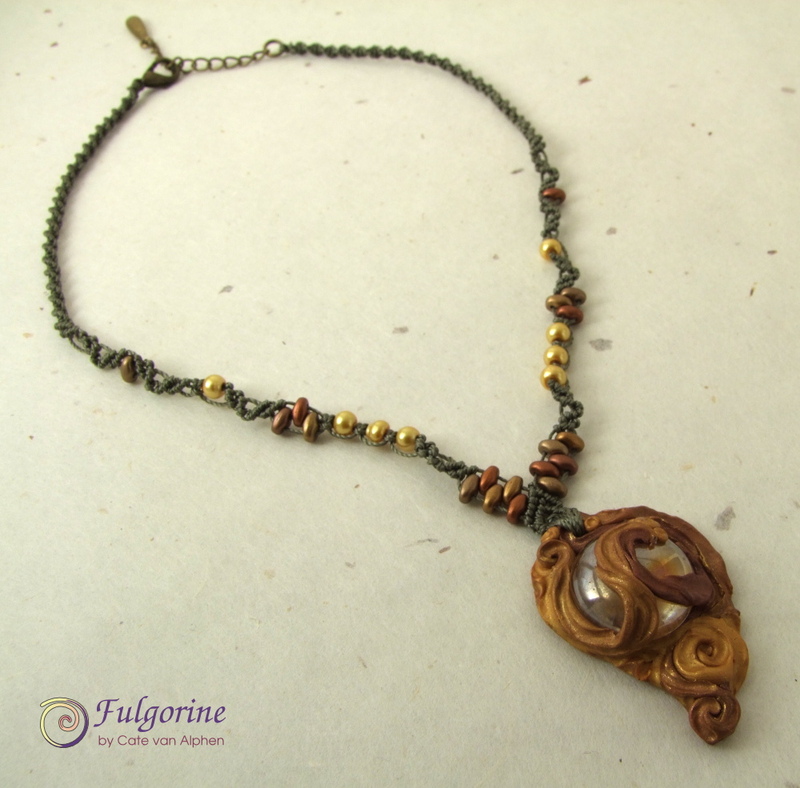 I call it an Oddment necklace, and it was a great way to use up some orphan beads. There’s no clasp – it just goes over the head. I like the way it looks different depending on the way it’s hung. I hope it conjures up some of the richness of Frida’s paintings. 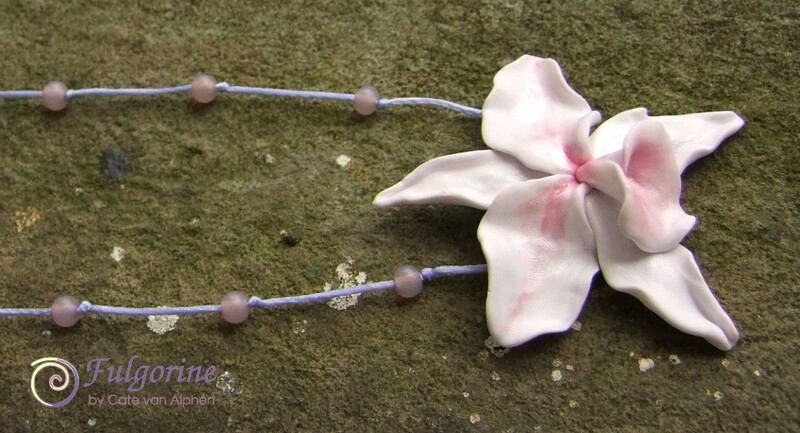 The short section of beads on waxed cotton cord is a nod to the intertwined thorns of the inspiration painting. 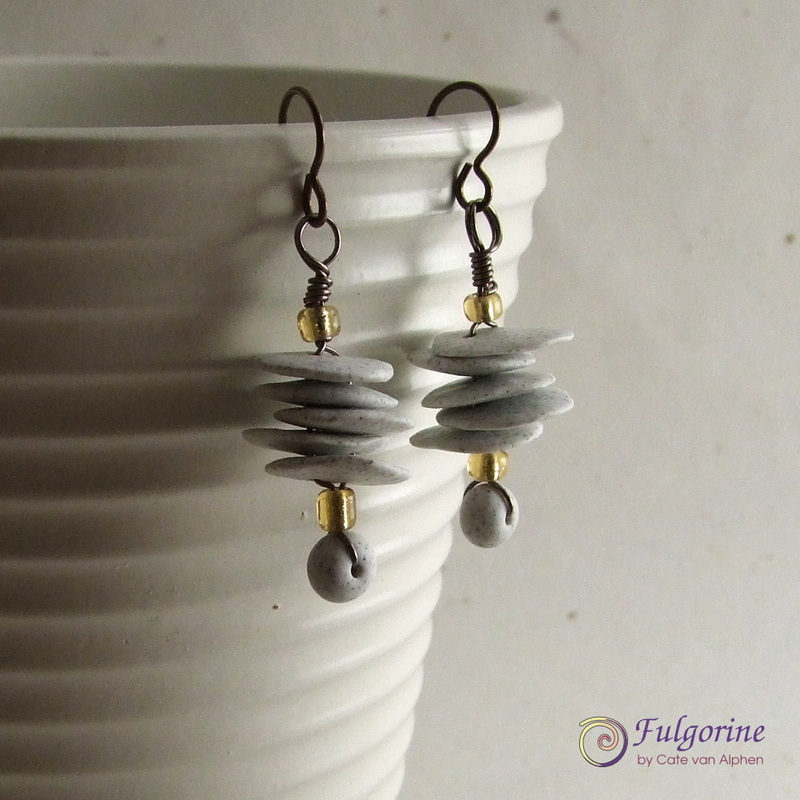 The earrings I made for this month’s Art Bead Scene Challenge may seem a little abstract because I can’t share all the steps I took to get there (yet!). 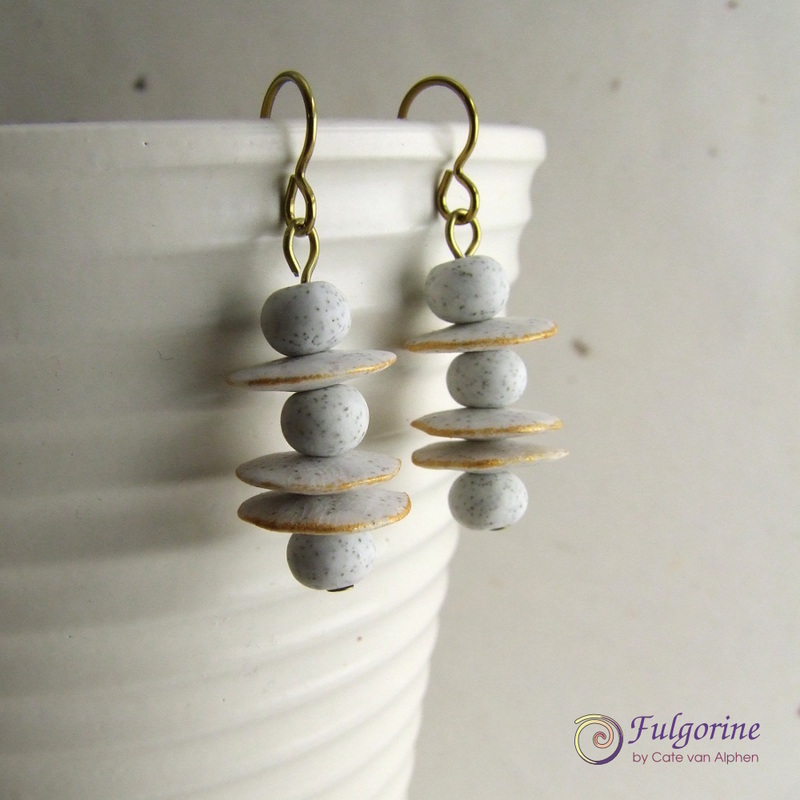 The beads I used are handmade by me from polymer clay (other than the gold seed beads in the last pair of earrings). 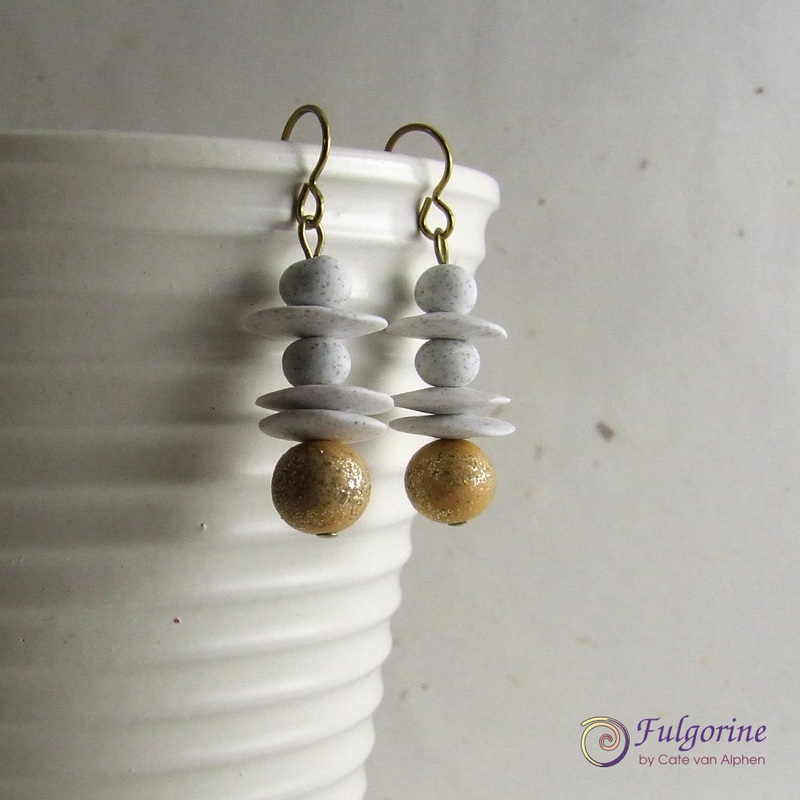 Monochrome earrings – inspired by the geometric structure of the painting. 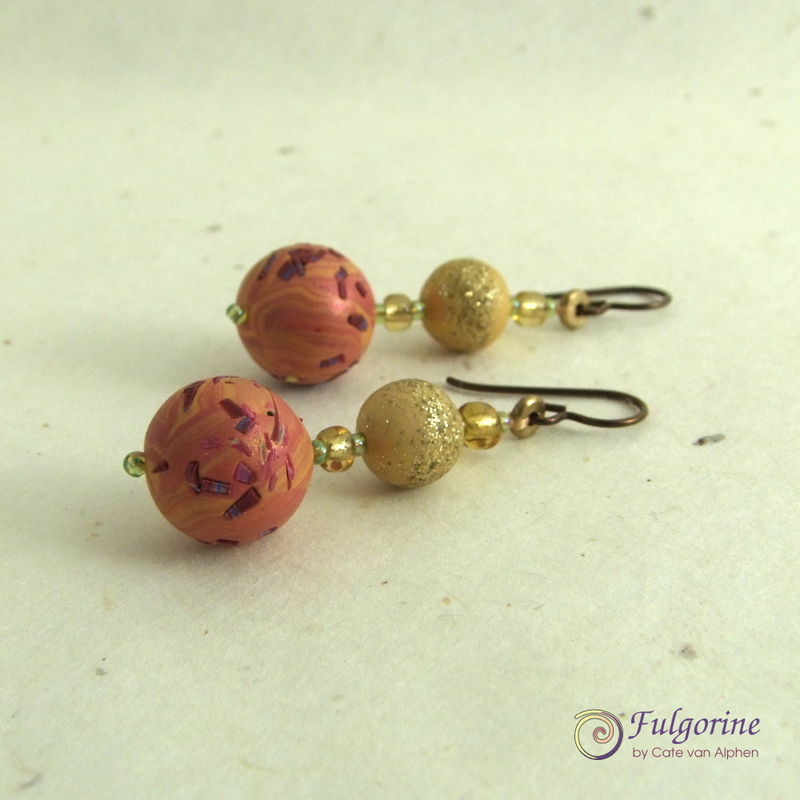 Earrings with gold glitter beads (because it’s Christmas). I thought I could get away with these because of the gold chandelier in the painting. The last pair is a bit of a tangent away from the painting. I was worried the stacks of flat disk beads looked a little like electric power line insulators so I tried a pair with the holes drilled off centre. I discovered that I needed to drill two holes to prevent the beads spinning around inelegantly. I was trying to achieve a look of an impossibly precarious cairn. The idea is pretty much the opposite of the order and structure of the painting, but don’t tell the muse! 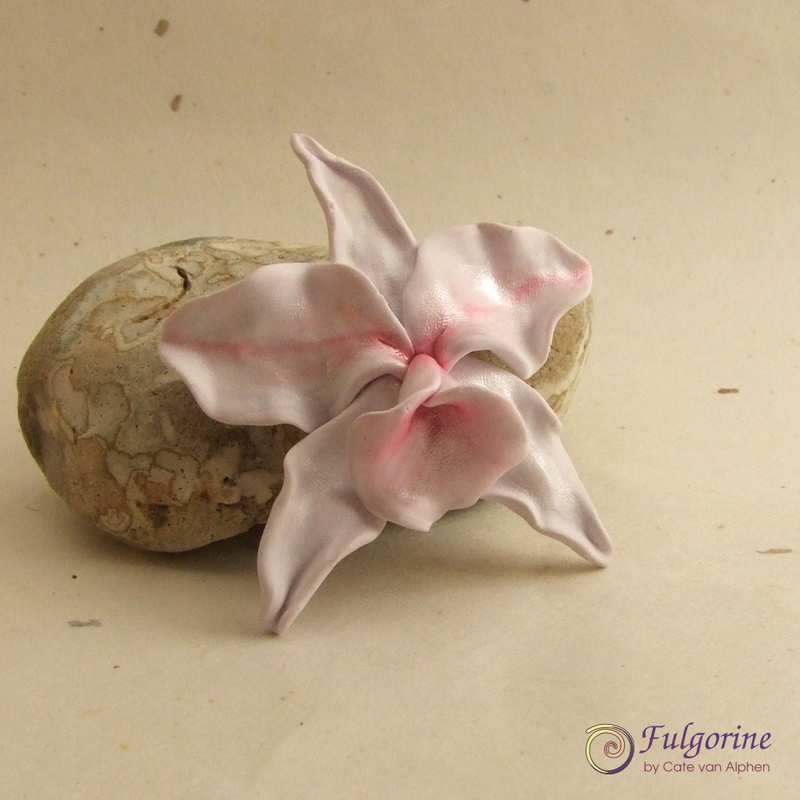 Initially I focused on the orchid, and made some polymer clay focal beads/pendants inspired by it. I did string one of the orchids, but I figured it either needed something simple or something totally flamboyant. I went with simple since my supplies are still packed. But then I thought the finished necklace was a bit too simple for a challenge piece. Next I realised that the charm I received from Chris Eisenberg as part of the Art Charm Swap looked like a little hummingbird. I matched the beads and thread to the charm without reference to the painting. 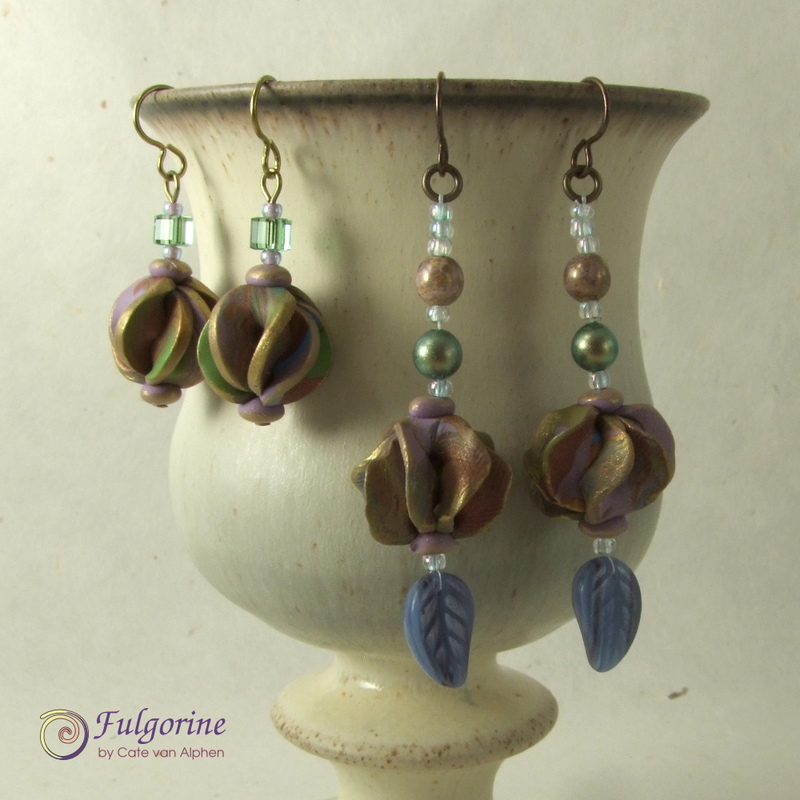 I made some polymer clay twist charms which are metallic green – they make me think of wings/leaves/petals. I added some AB coated beads and bright purple thread. 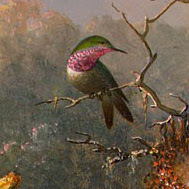 The purple thread surprised me until I took another look at the painting and saw the throat of the hummingbird. 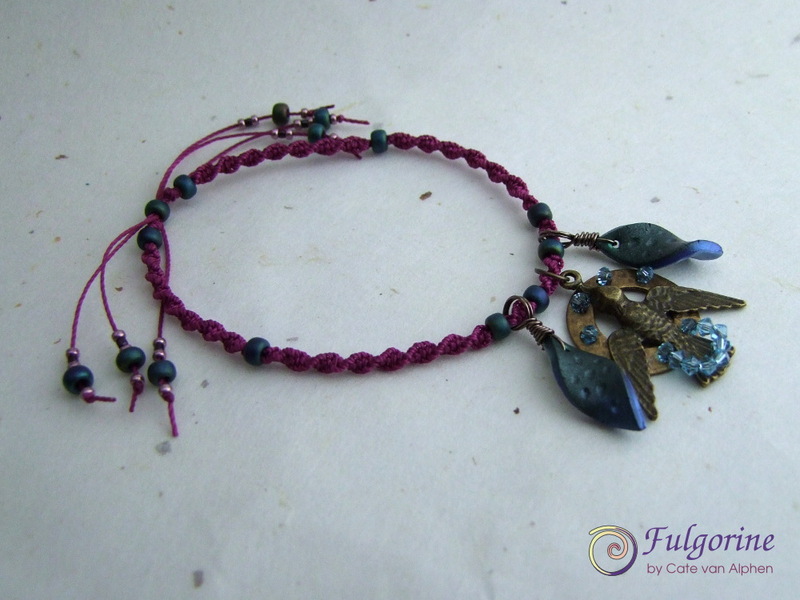 The charms are on a macrame cord with knots that twist forming a helix effect. I was thinking about the twist of the hummingbird’s wing as it hovers. I’ve been watching “The Life of Birds” on BBC catchup which has some wonderful slow motion footage of this (28:15). 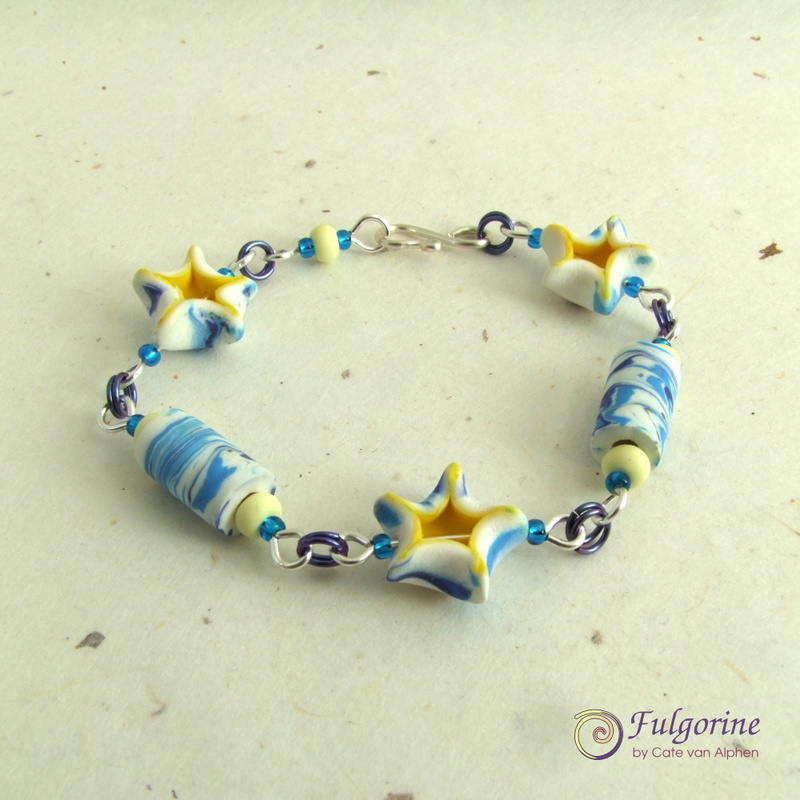 The bracelet is adjustable with the threads sliding through a central bead. 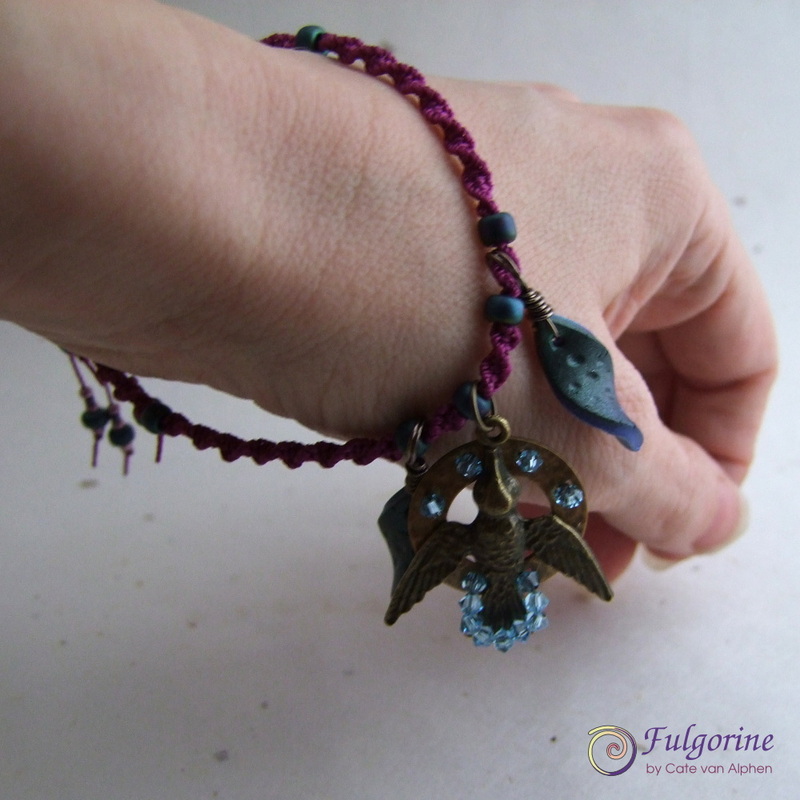 I have left the ends quite long and added a little stack of beads to each so that they flit around the wrist like tiny hummingbirds around a flower. There we go – Hummingbird Surprise! 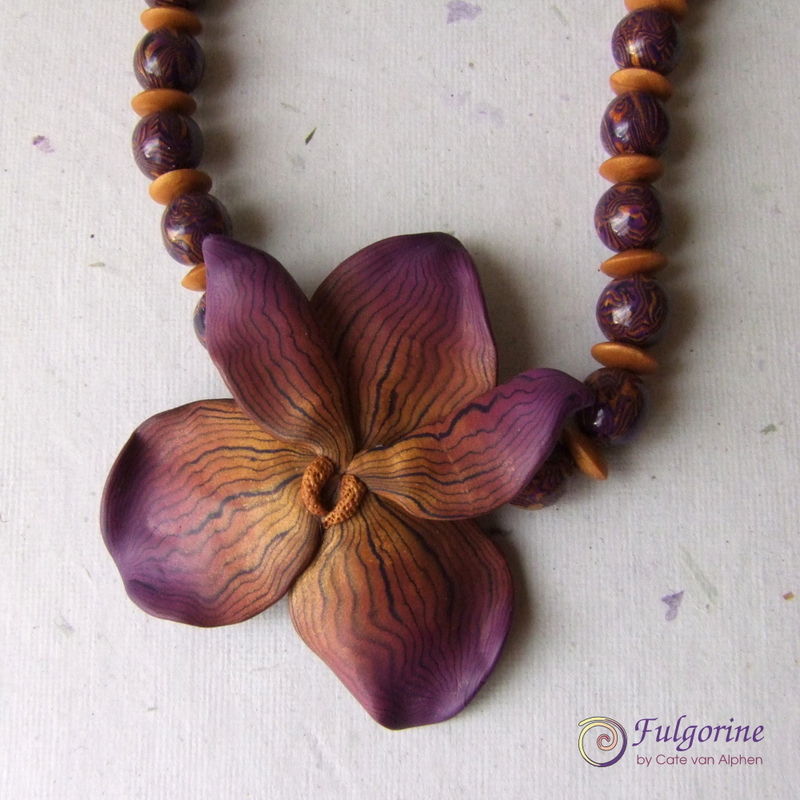 Back in 2010 I made my “Imperial Orchid” necklace. I really wanted to explore the idea further, but I never got round to it. So this month’s Art Bead Scene challenge painting was just the nudge I needed. 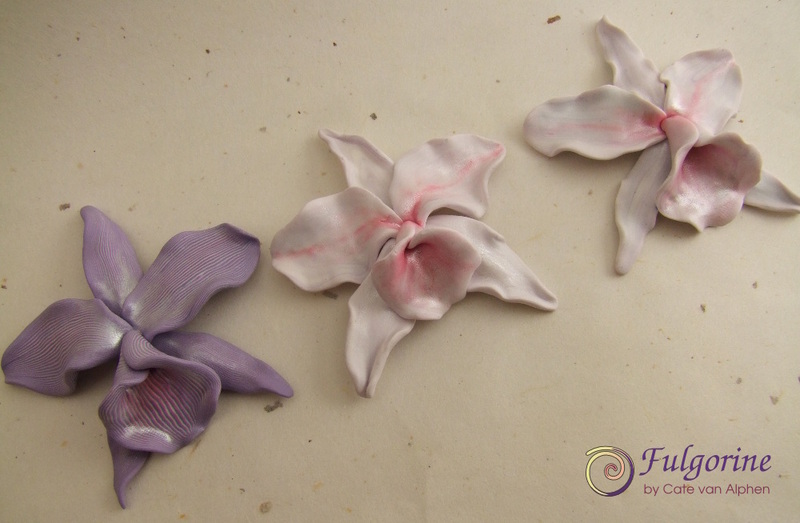 I started off making a pinstripe of magenta and lavender polymer clay as I could see those colours in the petals. Unfortunately the colours ended up too dark for what I was trying to represent from the painting. For the next orchid I made a subtle marbled mix of white and a speck of the previous pinstripe cane. I dusted on the pink using mica powders. I was much happier with these colours, but I preferred the proportions of the previous purple orchid. This time I was happy with both the colour and the proportions. 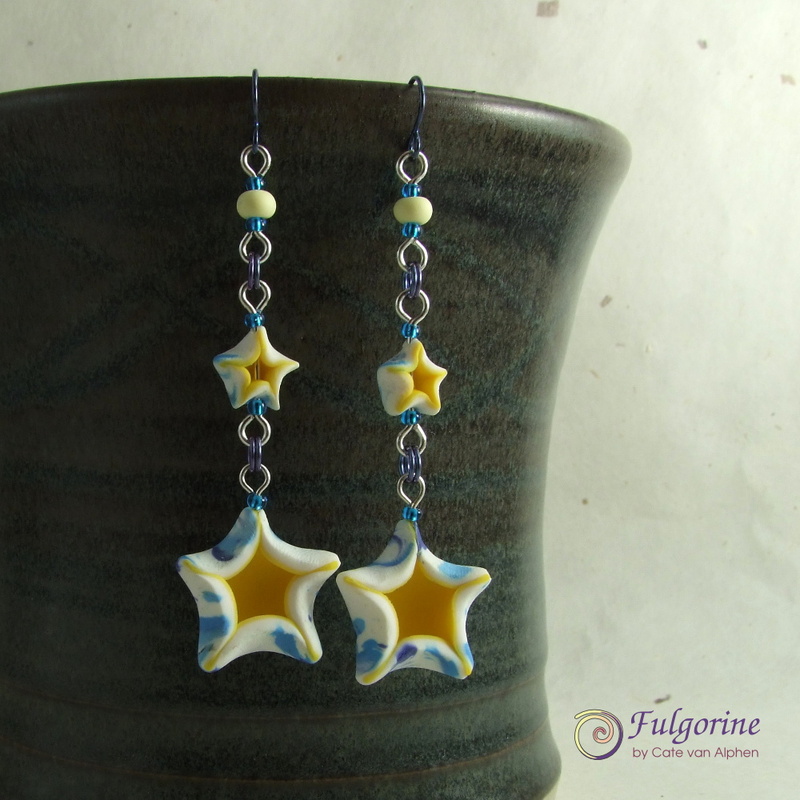 It seems good things come in threes as today, for the third time, my work was featured on Polymer Clay Daily :). This time it was my Spectrum beads. The outer two of these are now in my Etsy components store. I’m working the middle one into a necklace. 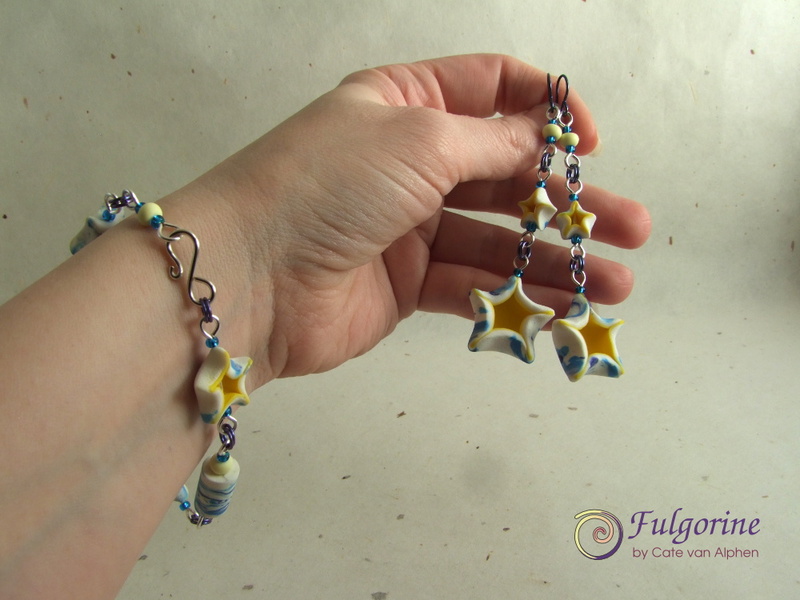 I may not have any beading supplies available, but I can still make some polymer clay beads! I made a sheet of clay with blocks of colours from rust to cream and of course that magenta. I scratched in branching lines like the tree which I highlighted with white acrylic paint once I had folded cut out circles to form the beads. I also painted the edge of the beads with ultramarine acrylic paint to bring in some of the colour surprises of the painting. I may have harmonised the colours too much. They don’t seem to pop as much as the painting. 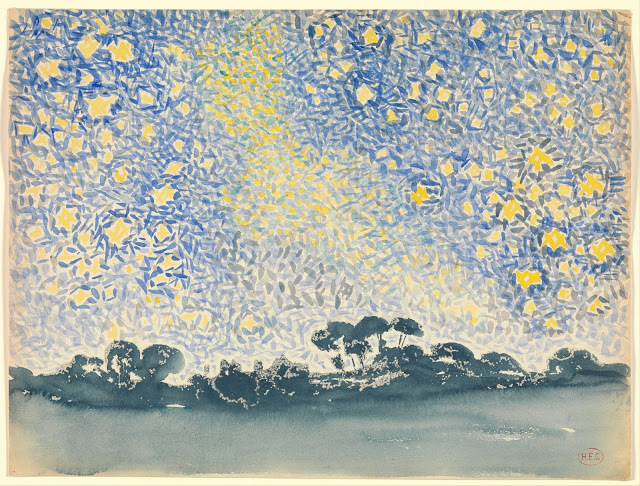 Maybe it’s because the bright yellow of the foreground is missing? 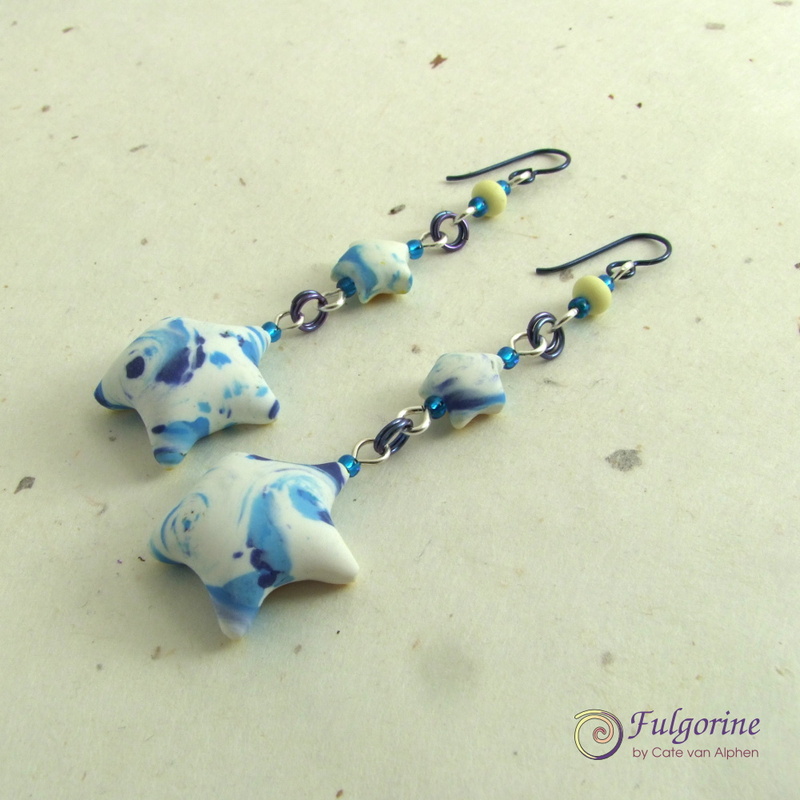 When I was finished making these beads there was enough clay for only two more smaller beads. Of course as soon as I have a pair of beads, I feel COMPELLED to make earrings. They are pretty simple, but I only had my wire and those gold beads unpacked from making my Art Charms. It feels really good to take part in the challenge again :).